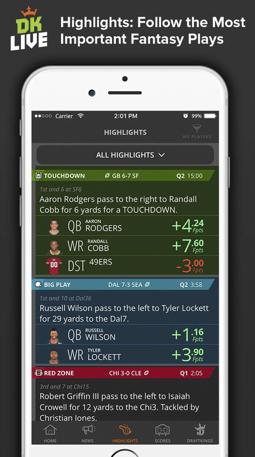 DraftKings has launched a new, free mobile app called DK Live, which provides the live information fantasy football players want to see, from a single app. This convenient app acts as the digital mobile version of “RedZone”, which eliminates the previous need to swap from app to app to get all the live stats and updates that fantasy players require. 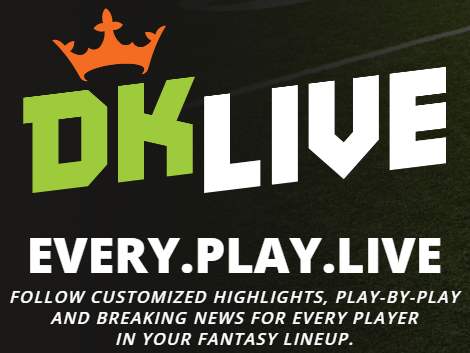 The DK Live app is a separate app from the main DraftKings app, where DraftKings DFS players actually create lineups, enter contests, and conduct monetary transactions. The DK Live app is currently available for iOS in the Apple app store for the iPhone and Android available in the Google Play store. Click here to check out our full DraftKings review or learn more about the DraftKings new player promos here. The DK Live app provides the ability for DraftKings users to customize the app to feed stats relevant specifically to their players in their fantasy lineups! This feature requires that the DraftKings app is also installed. DK Live provides a real time play by play feed for every player, every play, for any NFL game! 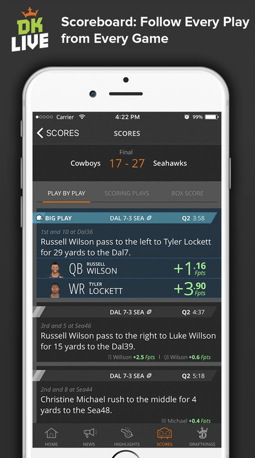 The DK Live app allows users to view every red zone play, touchdown, turnover, and 20-plus yard play for all live games! DK Live includes a scoreboard for all games and live news feeds for all the latest player news, including injury updates! 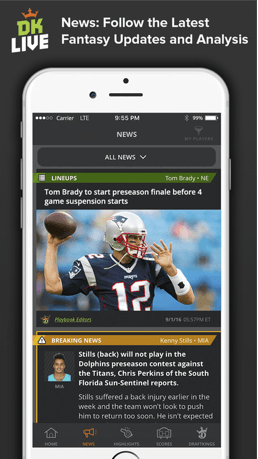 The DK Live app is a must-have, one-stop source of info for all football fans, fantasy players, and especially DFS fantasy players. The DK Live app is highly recommended and a must for fantasy football mobile users. The DK Live app also supports NBA, PGA, and MLB as well! 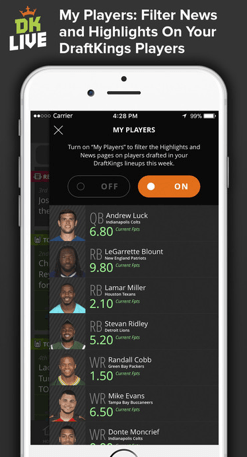 Check out details about our DraftKings mobile review here. Draft your team in minutes and start playing! Enter your own Draftkings review below, our guests will appreciate your feedback!